Male Devon Sewing has won something! I’m so excited! Well how exciting! Male Devon Sewing has won something! it might not be the Lottery or a years supply of chocolate but something much more special….. I came home today after doing a bit of shopping and behind the door was this months copy of Love Sewing magazine (If you don’t yet subscribe then hurry up and do so!). As I always do, I opened it up to see what free pattern was included; a lovely Slouch Gilet (Lu has already asked for me to make one) and then I opened the magazine…..
Well what a surprise! 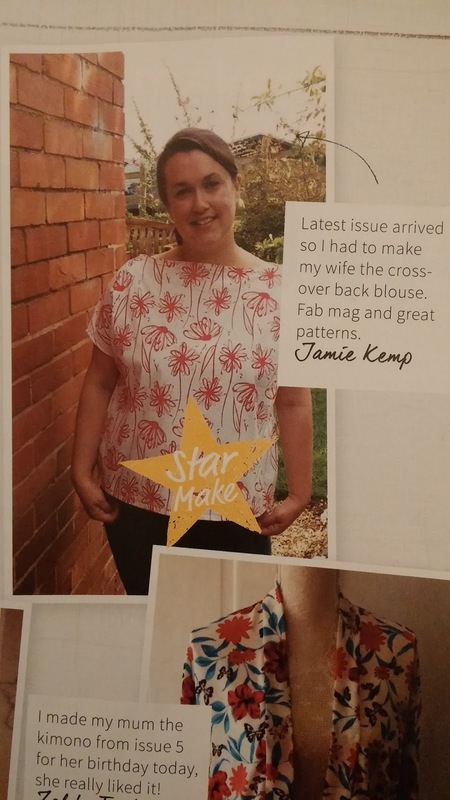 A few pages in on the ‘readers makes’ page is a picture of my wife, wearing the cross-over blouse that I made from the free pattern in last months free pattern! I took a second look and yes it was definitely her with the blouse. Best of all there was a big “STAR MAKE” on it! I couldn’t believe it! The blouse I made had won the this months prize! is that not only did I make something my wife loves but I have won a prize for doing so! I am really excited as the prize is a fabulous fabric bundle from Minerva Crafts. Someone, somewhere likes my sewing! Now I’m not going to go down the ‘I’m a man’ line but I am and I rarely see anything from another male in a sewing magazine (now that’s no fault of any sewing magazine but the apparent lack of males sewing) so I have to admit a little bit of pride to see a Star make from a man. So come on men, don’t be shy but get your sewing makes seen by the rest of the sewing community. Right that’s enough self indulgence and big-headedness but I promise I will blog about what I make with my fabric bundle. I also think I should submit a few of my own patterns for mens clothing to a sewing magazine or two. What do you think? I would like to publicly say how great Love Sewing magazine is and not because I have won the Star make! The magazine is a really good read and comes with fantastic patterns. For me I love the refreshing style and great tips. If you haven’t yet bought a copy then I really do suggest you have a look. You can also save loads if you subscribe. The next issue is out in the shops next Thursday 10th September so go and get a copy! 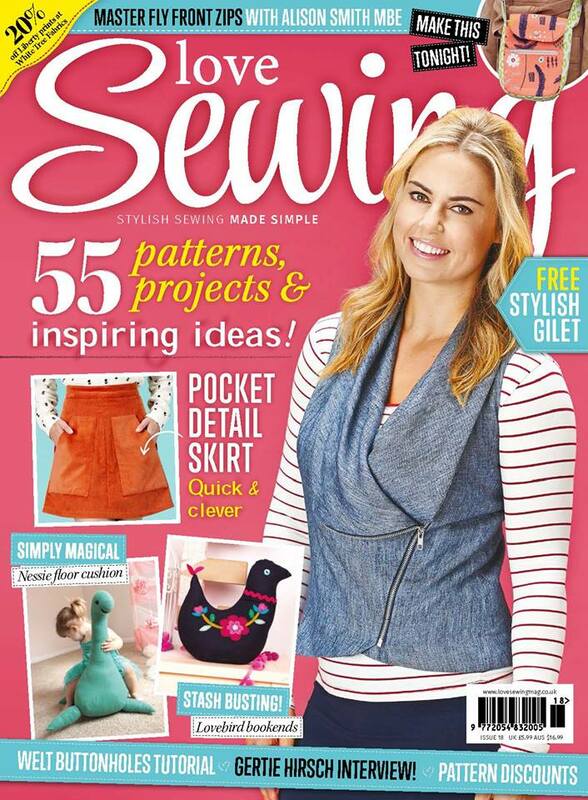 Love Sewing Magazine, Slouchy Gilet make. Some handy hints…. Well done Jamie, you and more men deserve recognition. Some of the best designers are men, and also, the best tailors in the world are men. Let`s her it for the boys who sew. I bet if you looked at it professionally vs home sewing you would see men, overwhelmingly dominate the profession while women are the vast majority of home sewers. That is why magazines and all marketing and sales are targeted at women. It makes sense that way. You are right more men need to make in roads to the home sewing world, that is dominated by women. Again congradulations!! Corey, thanks. Yes would be nice to see more men as home sewers coming forward. Congratulations! Your wife is so lucky. My husband was interested when he saw a man shopping for fabric the other day. He pointed it out to me as though it was something he had never seen. I keep telling him that retirement will be boring if I'm the only one with a great hobby! Thanks Su-z. Yes I remember the first time I walked into the local fabric shop and asked for some things, very weird faces from everyone. Now they ask me for my opinions and how to help their customers! Thanks Josie. Now I need to come up with some of your amazing ideas! As a man who is just starting to sew, you are The Man! Congratulations on your star. Lulu looks great in the blouse you made; bask in your recognition! I remember being very impressed with a coat you made a few months ago, one you based upon a Burda pattern. I would really like to see that in a magazine but also in my mirror. Keep up the great work, Jamie. I would be very proud to sew as well as you. Some day, perhaps. Hey thanks, such great praise! Yes the coat has gotten a lot of remarks and I look forward to wearing it again when the weather turns colder. I may draft my own version of the coat sometime for others to make. I look forward to seeing some of your makes soon and have fun!